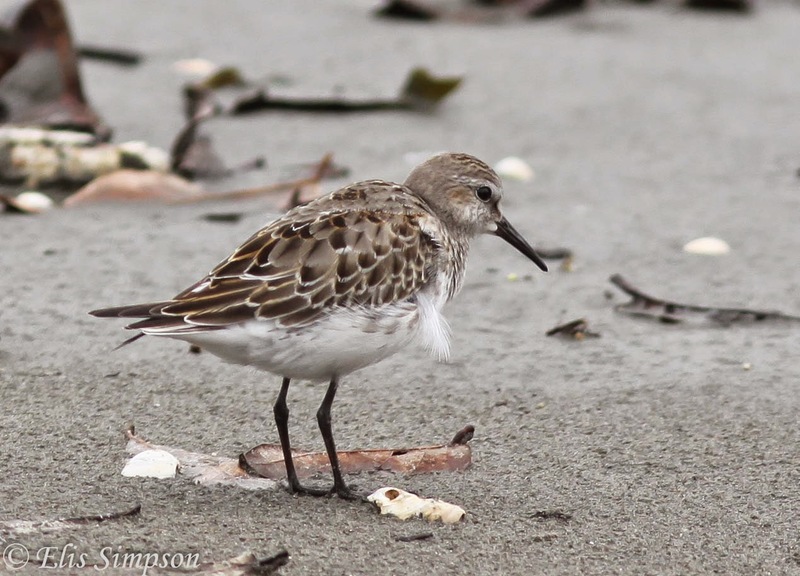 Wader Quest: New ID feature for White-rumped and Baird's Sandpiper? 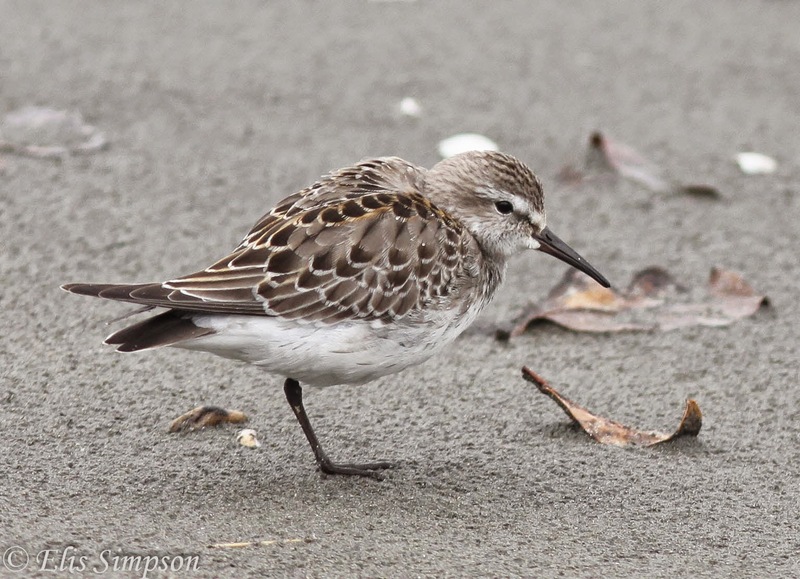 New ID feature for White-rumped and Baird's Sandpiper? Spending many hours looking at photographs, both our own and on the internet, and more recently at skins at the Natural History Museum in Tring, Elis and I noticed that there was a tendency for the feathering at the base of the bill of these two species to be distinctive and thought that perhaps this could be used as an additional feature to help ID a lone bird in a strange place. 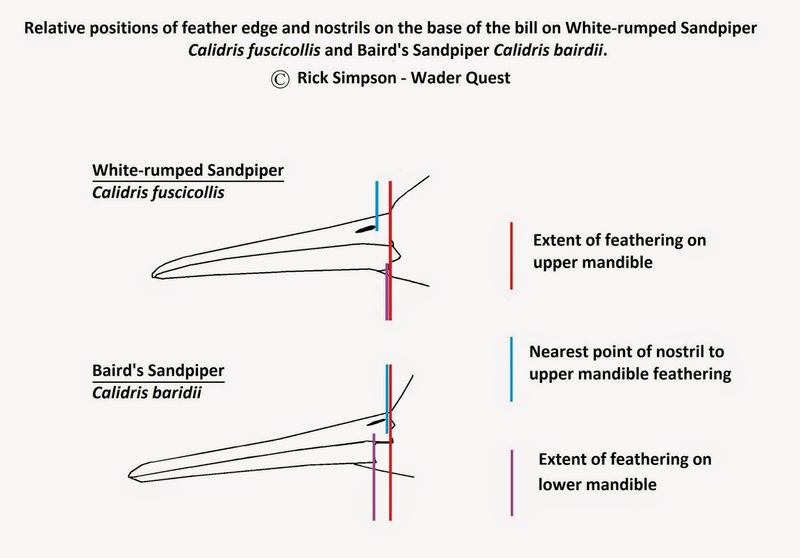 We do not claim that this is 100% across the board with all individuals and on its own would not be reliable (wear and tear and moult should always be considered in any assessment of feather features), but here is what we have observed. Baird's Sandpiper Calidris bairdii (left) and White-rumped Sandpiper Calidris fuscicollis can be hard to tell apart in the field without direct comparison. 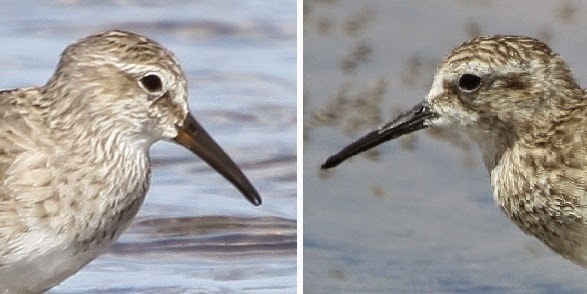 Figure 1 (below) White-rumped Sandpiper Calidris fuscicollis (top) Baird's Sandpiper Calidris bairdii (bottom): Note the shape of the feathering at the base of the bill. The Baird's shows a distinct step where the feathering along the lower mandible extends further forward giving the appearance that the bird has a protruding 'lower lip'. The feathering on the White-rumped is less visibly stepped in this way. Also note the respective positioning of the nostrils. On Baird's they are very close to the feathering and the step on the lower mandible extends well along them. On White-rumped the nostrils are further from the feather base and the lower mandible feathering extends only as far as the start of the nostril (see Figure 2 for more clarity). Photo. 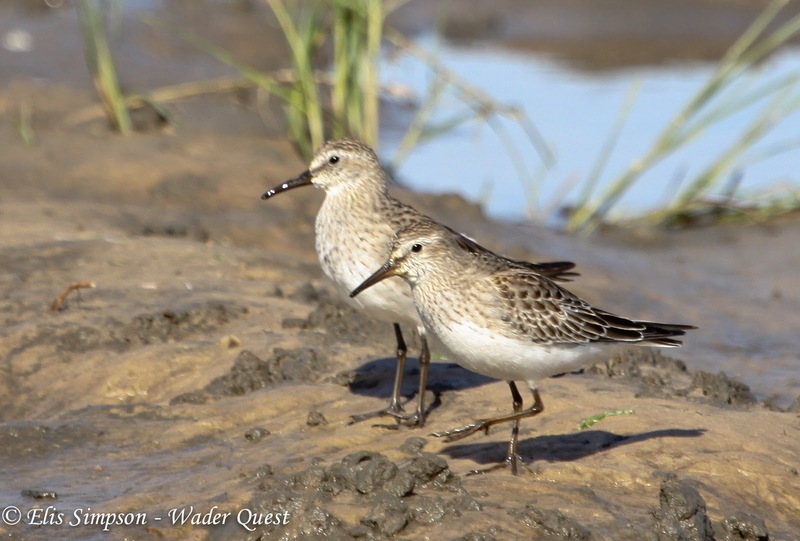 1: White-rumped Sandpiper (above) and Baird's Sandpiper (below). On Museum specimens (118 Baird's Sandpipers from North, Central and South America and 145 WRS from North, Central and South America including the Falkland Islands and Caribbean Islands) this feature was consistent in the vast majority of specimens examined. Some skins had been damaged in the face area and it was not possible to determine the structure, others did not show the feature to such a degree as that shown here. However we felt that the feature was consistent enough to mention as a possible aid to identifying these two cryptic waders when some doubt arises in the field. Figure 2: Here are two photos from the field. 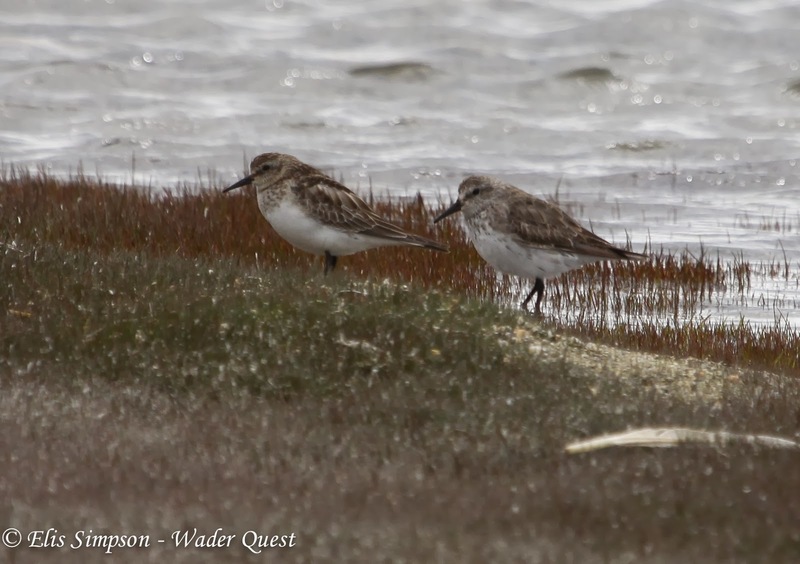 White rumped (left) and Baird's Sandpiper (right). Note the position of the nostril in relation to the feather details of the birds as outlined above. Also observe the general shape of the feathering at that point. The Baird's is fairly tatty but the feature is still clear. Here are some more examples from our photo library. 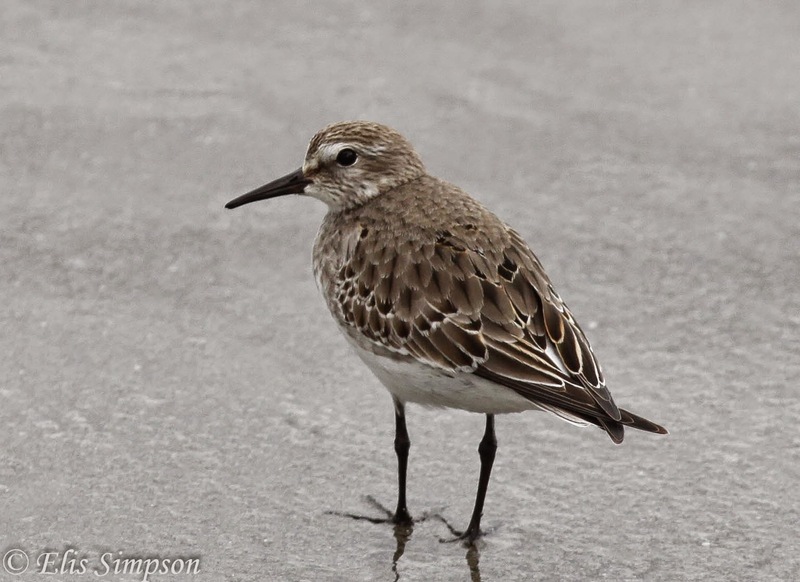 Photos 1-3 Baird's Sandpiper, photos 4-7 White-rumped Sandpiper. Here's one that bucks the tend. Although there seems to be a bit more of a step in the feathering in this White-rumped Sandpiper the feathering on the lower mandible still only just reaches the first point of the nostril compare this feature with Photo 1 (above). If you look at the webpages for photographs for the two species Baird's & White-rumped you can judge for yourself if we are onto something or not.